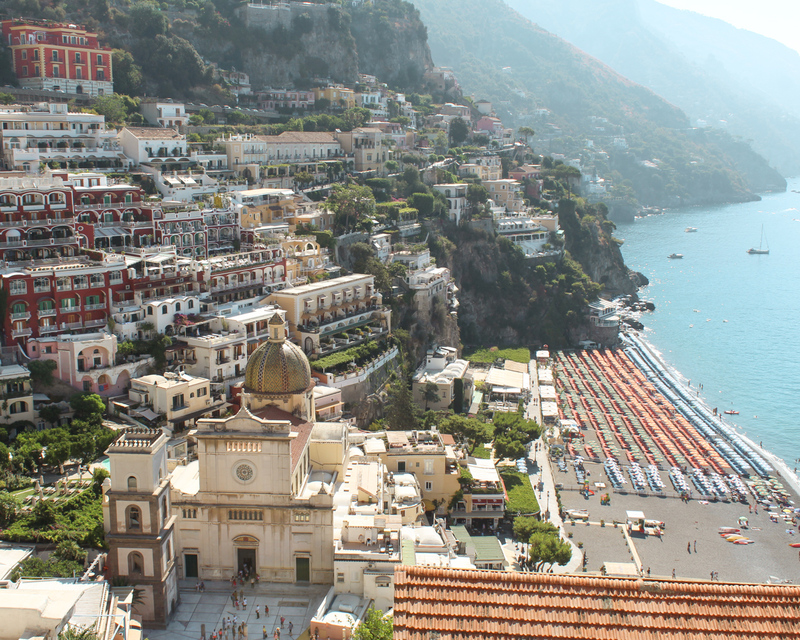 I can never get enough of the Amalfi Coast, particularly the town of Positano. Even looking at photos, it’s hard to believe this legendary luxury destination was once a poor fisherman’s village. Hipster travelers might write off Positano and think it’s touristy, but it’s my favorite town on the Amalfi Coast. Since moving to Italy, this idyllic coastal town has quickly become my happy place and I’m always finding excuses to visit. 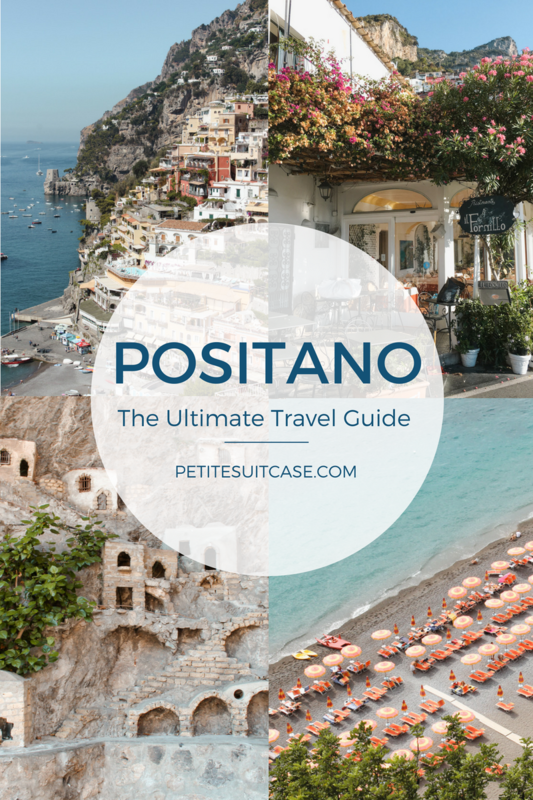 In this complete travel guide to Positano, I’ll share where to stay, the best places to eat, what to wear, my go-to aperitivo spots and things to do in town. 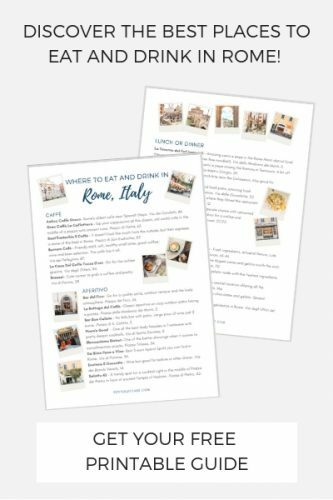 I also included how to get there (the big hurdle) and some other things to consider when planning a trip to the Amalfi Coast. 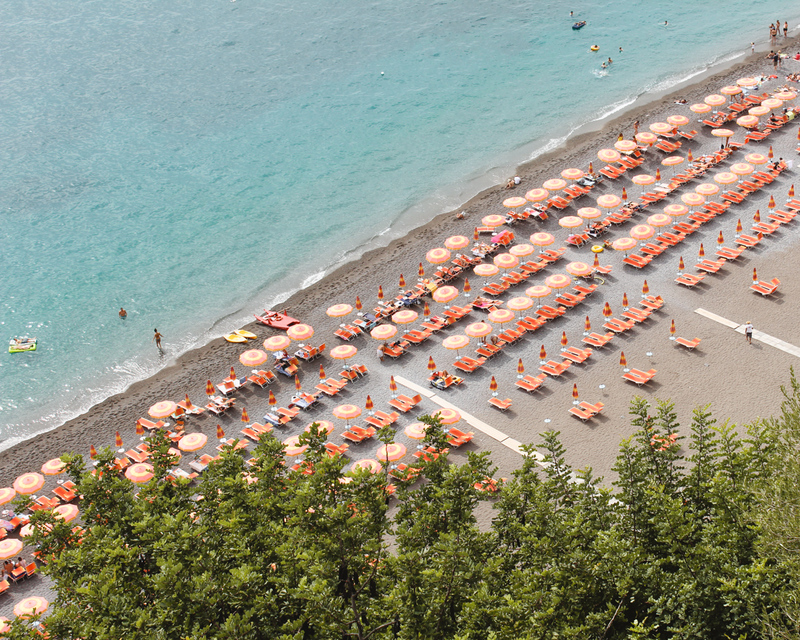 Spend the day at the lido Bagni D’Arienzo. This beach club was the best experience I’ve had at a lido in Italy. Hike the Path of the Gods. This is on my bucket list! You can’t miss the church of Santa Maria Assunta in the town center. Take a ferry over to Capri or a bus to Amalfi for a day trip. 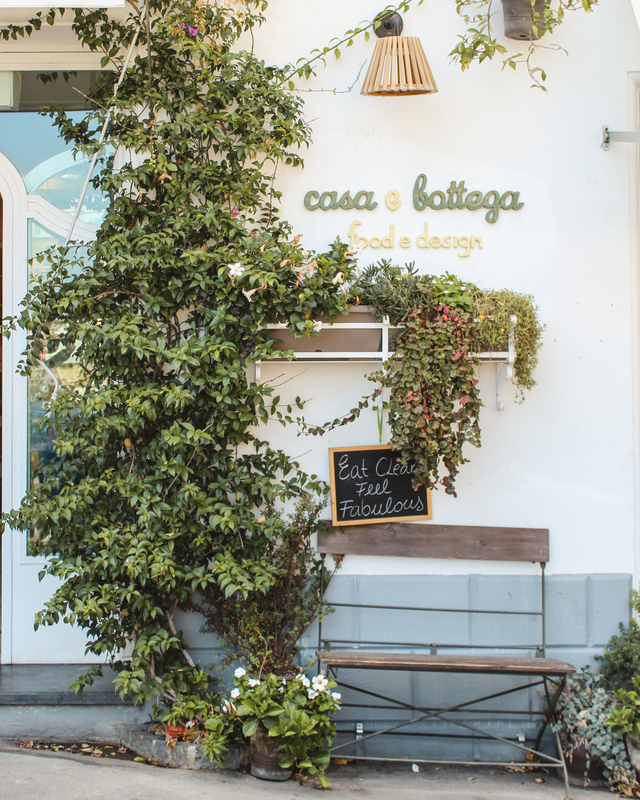 If you need more than a cornetto for breakfast, Casa E Bottega is a darling home goods concept store serving healthy salads, omelets and fresh smoothies. La Tagliata for an experience. 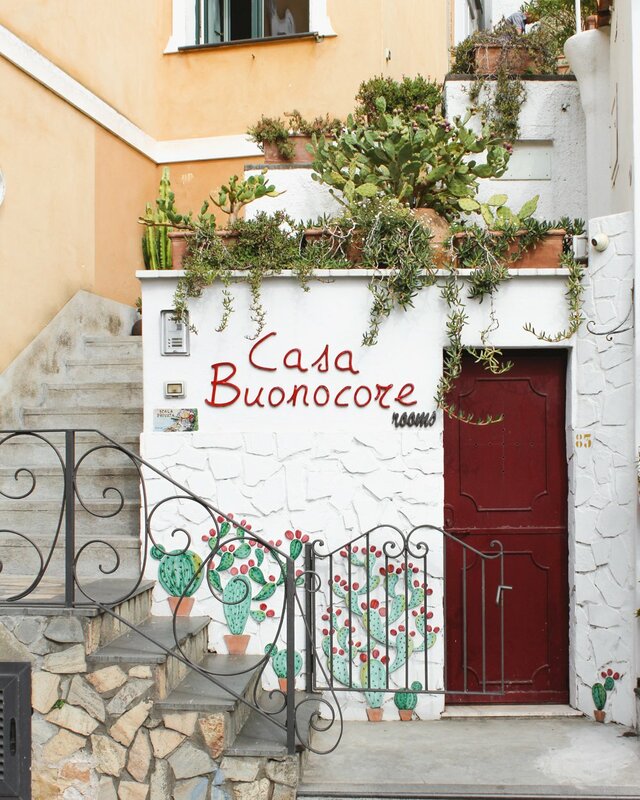 This restaurant up on the hill above Positano is known for it’s stunning views and appetizers so filling you’ll forget about the main course. Next 2 for an upscale dinner. Buca di Bacco Ristorante for dinner down by the main beach and La Pergola’s Buca di Bacco Bar downstairs for a casual aperitivo. Be sure to get the limoncello spritz… They put lemon granita in it! After posting this photo on Instagram, a few people commented that Il Fornillo is also a wonderful restaurant. 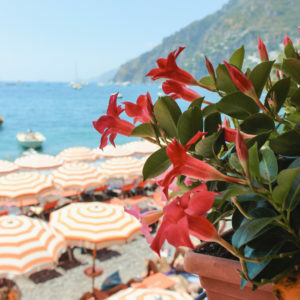 Along Positano’s smaller Fornilla beach, catch a relaxed drink at Da Ferdinando down by the water. 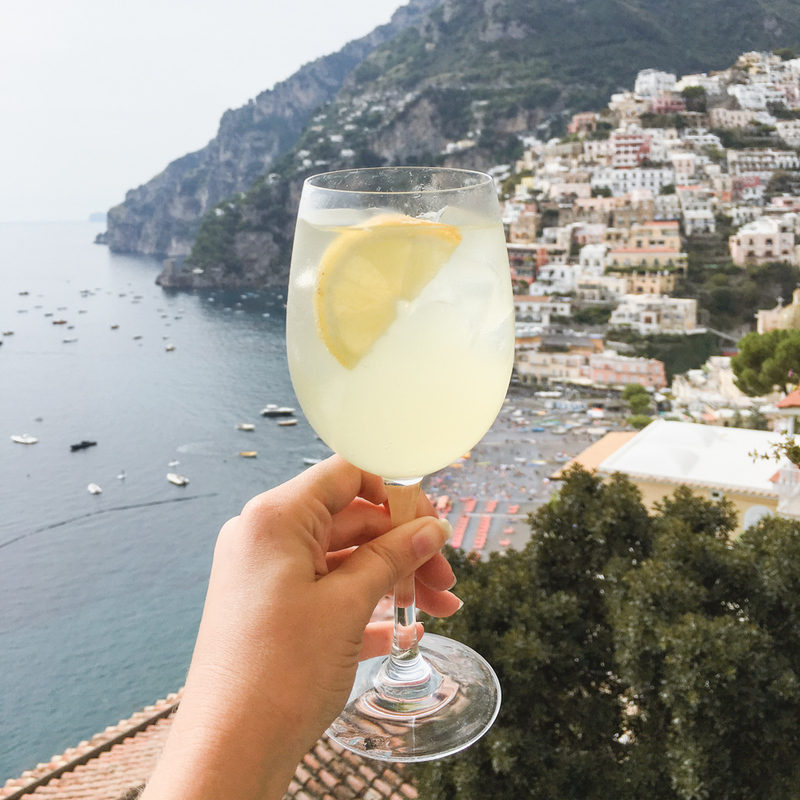 For a fancy (and pricey) aperitivo, posh crowd and stunning views of Positano, Franco’s Bar of Le Sirenuse is the place to be seen. Bar Bruno for an equally beautiful view a little farther up the street. I’ve stayed at Dimora del Podesta and would absolutely return. This is a wonderful B&B with friendly staff, an excellent location and fair price point. Alfie felt right at home! Villa Palumbo is a nice budget option offering basic rooms with a terrace and mountain views. On a last minute trip, I felt like I won the jackpot with the last room available at Hotel Dimora Fornillo. They have a peaceful grassy terrace with stunning ocean views and easy access to Fornillo beach. Casa Albertina is a more central option (read: only slightly less stairs) for rooms with a balcony and ocean view. 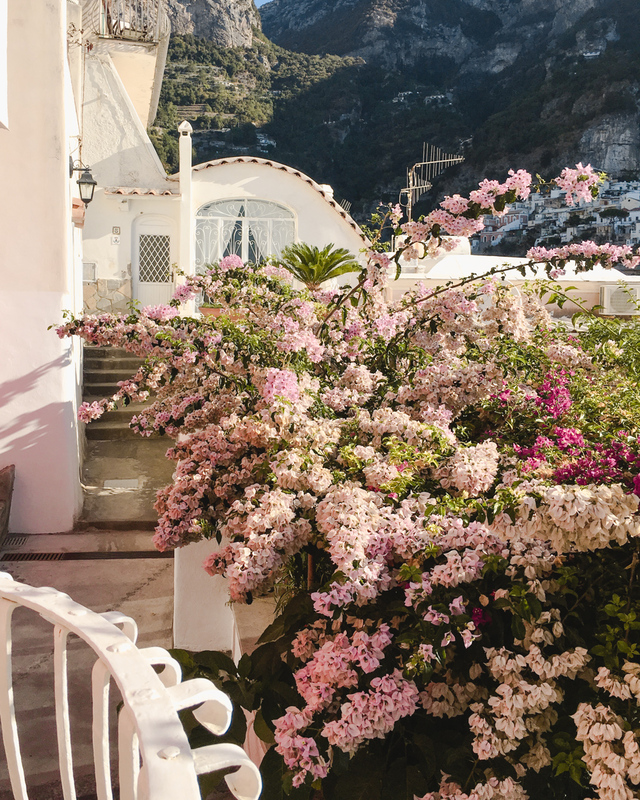 For a five star experience, Le Sirenuse on the main street or Il San Pietro di Positano and Villa TreVille a little outside of town. You’ll want to save some room in your luggage for souvenirs. 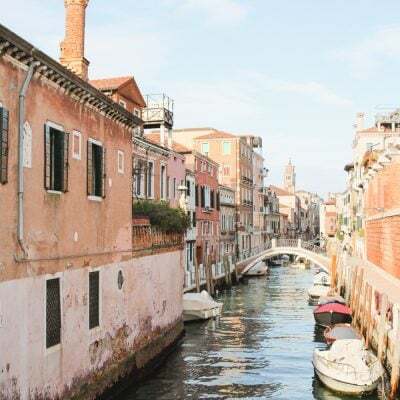 When you’re there, check out Nadir or La Bottega Di Brunella for fine linen. Also try to pack light as you might be carrying your luggage up stairs and hills. I always bring flat sandals, a bathing suit and a few dresses. Be sure to pack a hat for sun protection and big tote for going to the beach. For the evening, I’d recommend avoiding stilettos, but you could still get around in wedge espadrilles if you’re prefer heels. From the downtown Naples train station, you can take the Circumvesuviana train to Sorrento. Please note that this isn’t exactly a luxury train and closely watch your belongings. Transfer to the Sita bus in Sorrento. The Sita Bus leaves at least twice an hour from Sorrento during the high season (schedule). From the Naples Airport Capodichino, you can take a bus directly to Sorrento and bypass the Circumvesuviana train (10 euros). I used Curreri Viaggi once and would recommend it over the train if timing allows. If you’re coming from Rome, you might also want to consider taking a train to Salerno and then take a Travel Mar ferry to Positano. Both Sorrento and Naples are worth seeing, but if you just want to get to Positano as quick as you can (damn the cost! ), then I would hire a private transfer. I usually drive to Positano, but I’ve also hired a personal driver with a group, taken the Circumvesuviana and the different bus options. It all depends on your comfort level and how much you want to spend. The drive is about 90 minutes from Naples. Most hotels will be able to direct you to their overnight parking (around €20 a night). I’ve used both Parcheggio Anna and Milano. If you’re going to rent a car be sure to read my tips! 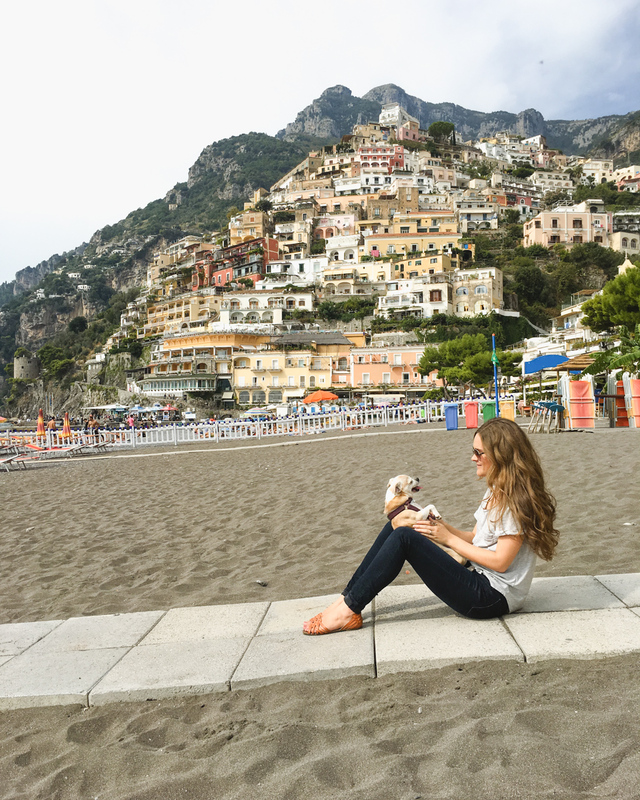 How long should I stay in Positano? This really depends on your budget and the type of vacation you are looking for. If you are a beach person and just want a relaxing holiday, go for it and stay a week! 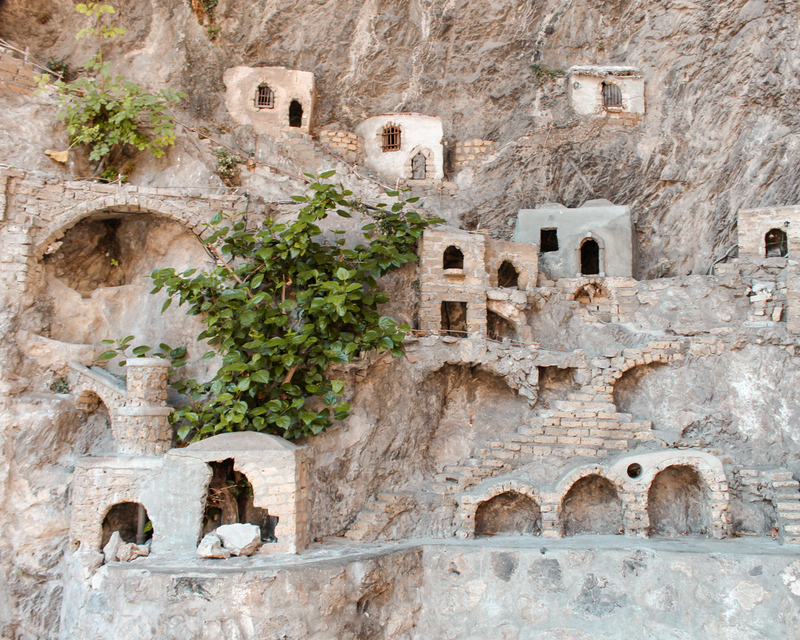 However, hotels are more expensive in Positano. 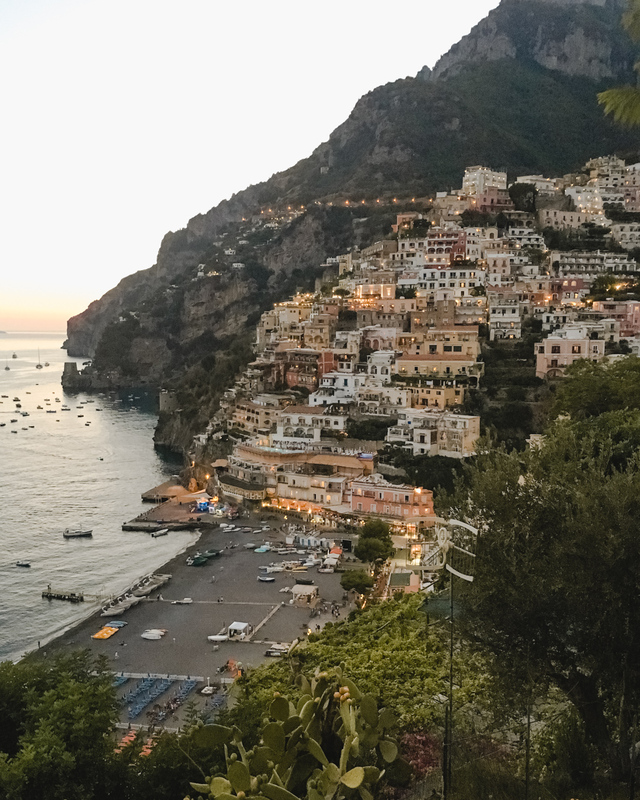 If you’re working with a more limited budget, it is possible to enjoy what Positano has to offer for just one night. 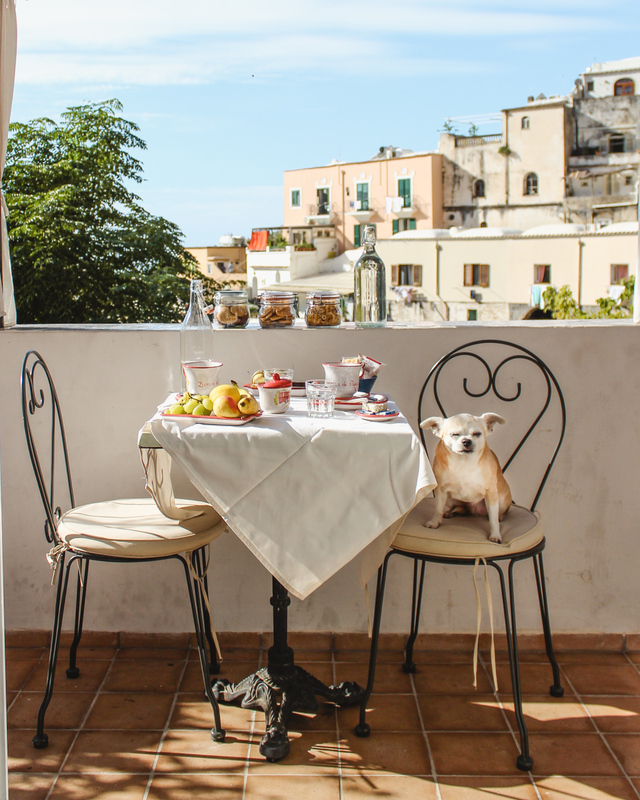 While you can do a day trip from Naples, it is nice to stay at least one night. 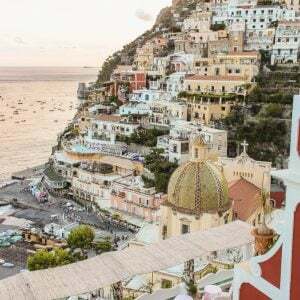 After all the cruise ships have left and the day-trippers have returned to home base, Positano seems to quiet down and you can really experience a different side of the town. 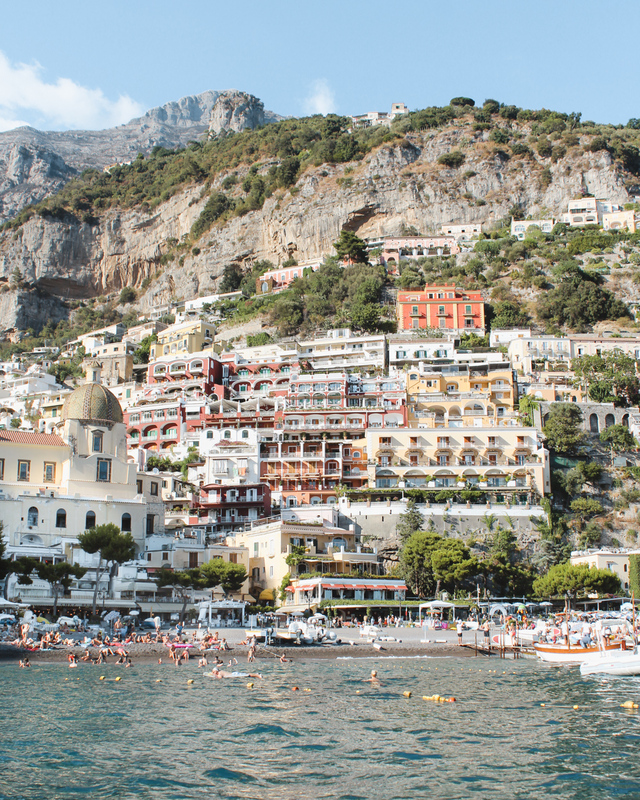 Positano is a luxury destination on the Amalfi Coast and it ain’t cheap my friend. You can literally stay for three nights in Lisbon for less than one night in a two star hotel in Positano. 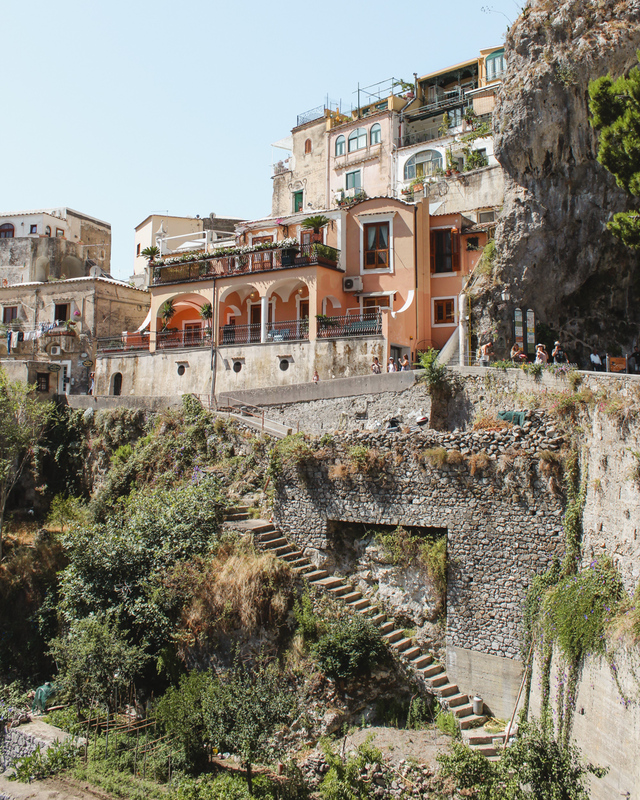 Positano has a TON of stairs and steep inclines. People don’t talk about this enough. I’m a little embarrassed, but I am always a little sore after a weekend in Positano! So if you have a stroller, heavy luggage or an old dog named Alfie that you have to carry, expect to get a work out! Yes, this town floods with tourist during the summer and when a cruise ship ports in Naples. 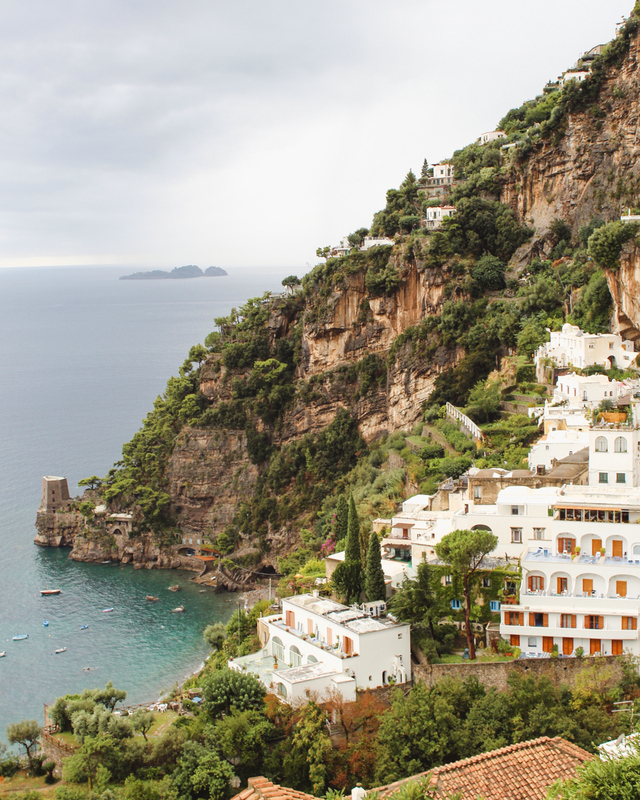 You may want to consider shoulder season if you want Positano all to yourself. I also went the first weekend of October last year and it was still lovely. The clouds were lurking and it sprinkled one morning, but there were certainly no lines or crowds. Personally, I’m not going to let a little crowd get in the way of a sunny beach day and this sunset view…. 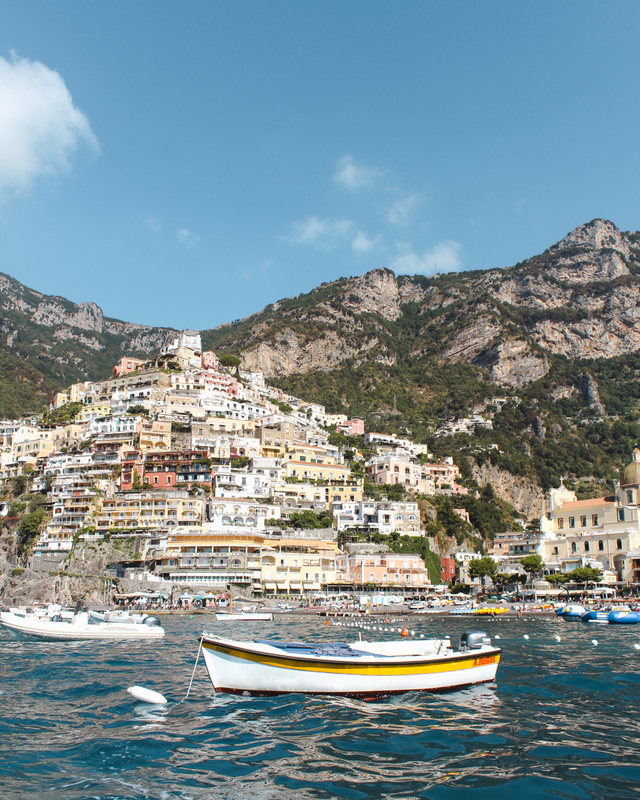 John Steinbeck was right, “Positano bites deep.” I practically start planning my next weekend getaway right when I get home. Ema, Thanks so much! 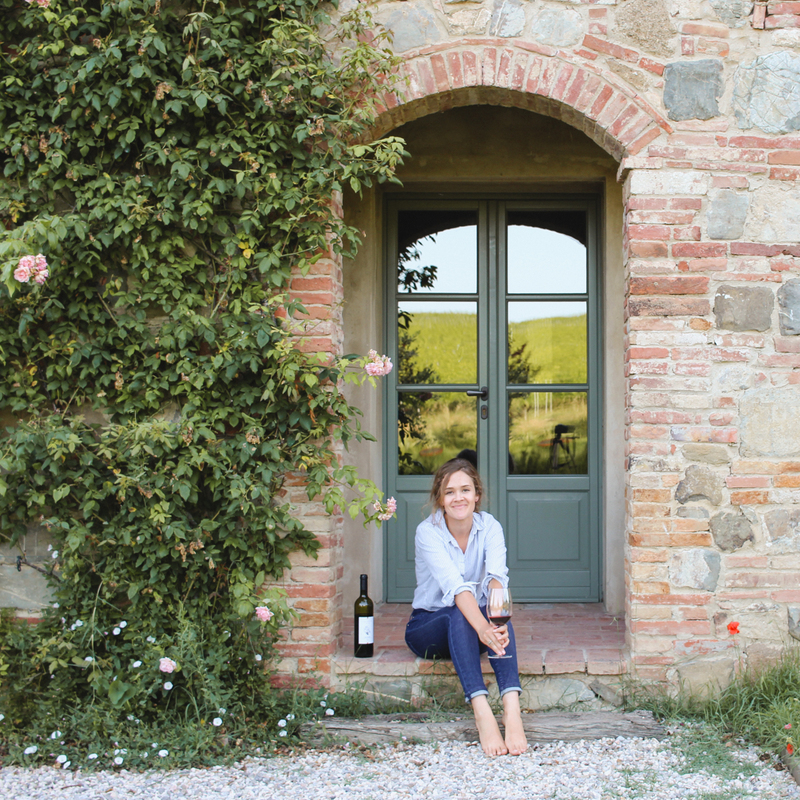 Italy is such an amazing place and you would love all the Art History! It’s such a lovely spot, Sandy! 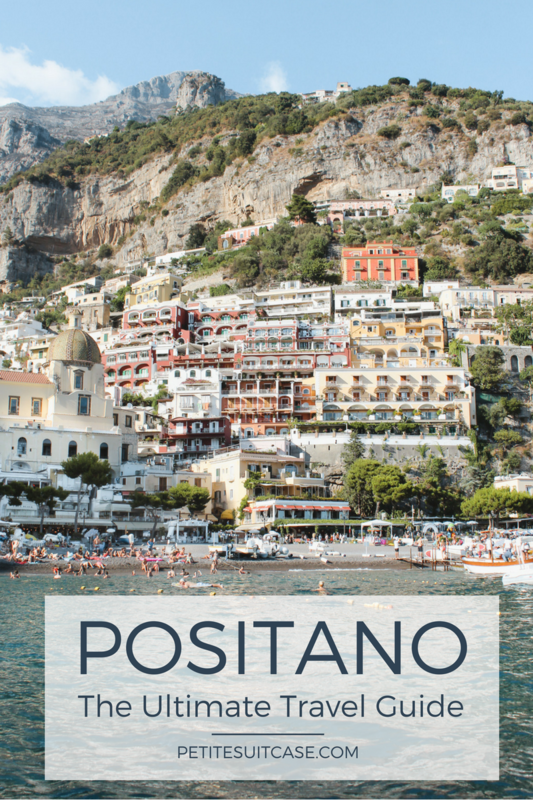 Positano is one of my favorite places in Italy! I’m dying to go to Positano. Your pics are so lovely! Thank you, Jessie. I just love this little town! Amazing! What a ravishing blog entry. It influences me to need to go to Italy so gravely! ? I cherish the greater part of your substance. It is so splendid and excellent. 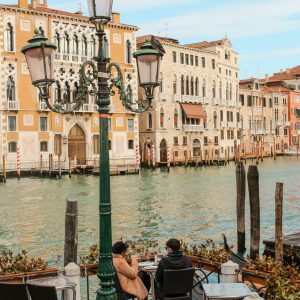 Your blog has given me so much travel inspiration. Your photos always look so dreamy. Based on this post, it looks like it was hot/warm even in Oct when you visited. 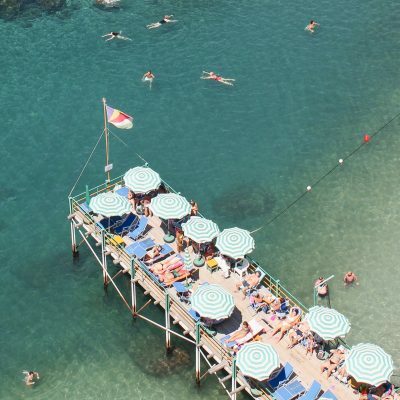 Which month (May vs June) is a better time to visit the Amalfi coast in terms of weather/budget? Also, we managed to drive around the Dolomites, are the type of driving similar in that area (narrow road/switchbacks/fast drivers …)? In the Dolomites, the roads definitely have a lot of switchbacks (at least in the area I went to in Corvara). In my opinion, the drivers were less crazy and they generally follow the rules of the roads more than the area around Naples.